If you have updated Twitter app at phone then you can easily get support to add and managing multiple Twitter accounts at your smartphone. Most of the person have to use his personal along with business Twitter account. Now, they can easily manage both accounts at the same time on his Smartphone. If you don’t have updated Twitter app at your phone then you are not able to add and manage more than one accounts at the same time. You have to logoff first Twitter account and logged in second Twitter account. But if you have updated version of Twitter account then you can easily managing multiple Twitter accounts at your Smartphone. It is a great advantage for all those users who maintain his Twitter account. Now they can not only tweets at his personal Twitter account but also able to tweet at his business Twitter account. 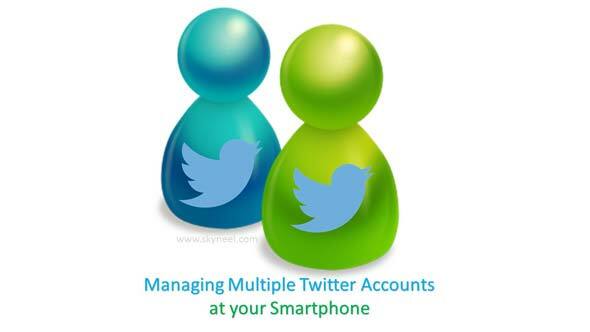 Before start managing multiple Twitter accounts at your smartphone you must ensure that both accounts are running properly on Twitter. After that you must have to take given simple steps to start managing multiple Twitter accounts process at your Smartphone. Step 1: Open your first Twitter account at your Smartphone. Step 2: Tap on your active Twitter account photo which is placed at top left corner of your phone. Step 3: Here you can check your active Twitter account profile. Now if you want to add another Twitter account then tap on the drop down arrow. Now, you can get two options – Create new account and Add existing account. Step 4: You can choose Add existing account option and fill either your phone number, email id or username of second existing Twitter account. After filling the password tap on the “Log in” option. Now you can check both Twitter account shown at your profile window. You can easily manage both Twitter accounts at your Smartphone. Now you can choose any Twitter account on which you want to compose a new tweet by tap on your profile icon. It allows you to easily switch between your more than one Twitter accounts. I hope this guide is useful for all those users and want to managing multiple Twitter accounts at his Smartphone. If you have any query regarding this guide then please let me know via comment box. Thanks to all.